This blockbuster sequel kicks off in Hong Kong, before flying back to Los Angeles and staging a grand finale in a Vegas casino. 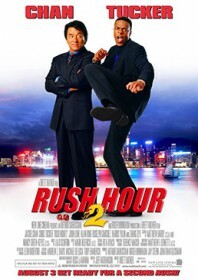 Lee (Jackie Chan) and Carter (Chris Tucker) return to their usual culture-clash buddy cop routine to chase Hong Kong triads on their home turf. Then there are the sub-plots: one, in which John Lone plays an ice-cool gang leader who has killed Lee’s father; and another involving Roselyn Sanchez as an undercover servicewoman playing off the affections of the film’s central double act. Then there’s Crouching Tiger‘s Zhang Ziyi in a vampish supporting role as a lethal assassin with deadly kung fu skills. With success at the box office seemingly guaranteed, everyone is having a great time, which explains why this sequel is a lot funnier and more charming than the first film. The chemistry between Chan and Tucker has become endearing, and the film is always entertaining, with standout set-pieces at a massage parlour and a physical finale involving mad stunts and nano-bombs constituting the best of the action. Even the obligatory outtakes are great.